✓ Free Domain for Life! If you are currently hosting with this web hosting company, please shared your experience by becoming a guest interviewee. Do you have any experience with the host? Have your say on eHost here. Some of us have been around the block a time or two, so to speak, when it comes to website development. Then again, there are some of us who are just starting out with a website or blog of our own and need a bit of hand-holding and not a lot of options or features we won’t use. If you want simplicity, a user-friendly walk-through to get your site up and running and a management console that is super-easy to understand, then eHost.com has the features you are seeking. It might surprise you to note that eHost has been providing web hosting services for a really long time; over 20 years, to be exact (the company was founded in 1996). All that time in business has helped them do it right; they have earned a coveted A+ rating from the Better Business Bureau. Sure, they’ve gotten their share of customer complaints, but eHost has resolved all of them in a satisfactory manner. Recently, the brand was snapped up by the Endurance International Group (NASDAQ:EIGI), well-known for its large roster of tech and software-related companies. Word is that eHost will take the place of iPage as the flagship, budget-priced hosting service for EIG. Because eHost offers a very basic hosting package, you won’t find the option of choosing a datacenter that is nearest your location. From what I can tell, they only have one datacenter, but when testing it on the Bitcatcha Speed Server Checker, the site hosted outperformed the majority of other websites we’ve tested (faster than 60% of the Alexa top 10,000 global sites), earning an B rating here, too. Of course, page loading was speediest in the United States, but even the furthest location tested, Australia, had more than acceptable results (237 ms). I tested eHost as a web development newbie would and chose the Website Builder, as opposed to cPanel, as the management console for my test website. 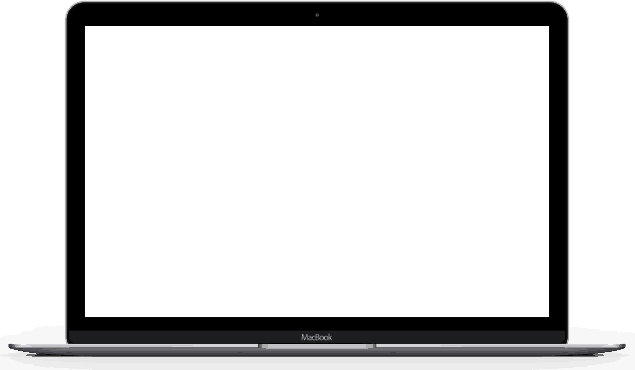 It has a very clean interface that is easy to read and easy to use. eHost offers thousands of templates on which to base your design and also allows you hundreds of ways to customize the template with color, image editing, fonts, backgrounds, text styles, pages and more. Although this can’t be used for a WordPress site, you can add a blog and/or ecommerce functionality. Overall, it was quick, clean and simple to get a new website published. Important: You will be prompted to choose either cPanel or SiteBuilder plan when you first login. Once chosen, you will not be able to revise it without losing your existing files. So, is eHost Worthy of the EIG Name? As long as you aren’t looking for lots of bells and whistles, eHost is a very responsive, user-friendly and reliable hosting service. But again, if you have a little more budget, we recommend going with other cheap hosts with more flexibility. No. eHost only offers yearly plans. You can pay in advance for up to three years, for the best discount. Your first payment is eligible for a 50 percent discount, but will renew at the regular rate. Can I host more than one site/domain on a single eHost account? Yes. 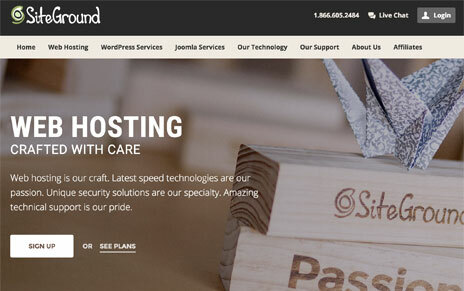 eHost’s shared hosting plans include unlimited domain names and subdomains. eHost’s knowledgebase states that your bandwidth usage is unlimited, however they do impose limits on CPU resources, processes and files. If you have several websites, you may find that your account exceeds these limits. eHost offers only shared hosting, so if this is the case, you may have to move your hosting to a provider who can better handle your needs. Is eHost a good choice for a website that gets a lot of traffic and visitors? Yes and no. They truly offer unlimited bandwidth and traffic, but that does not mean these are available in infinite amounts. 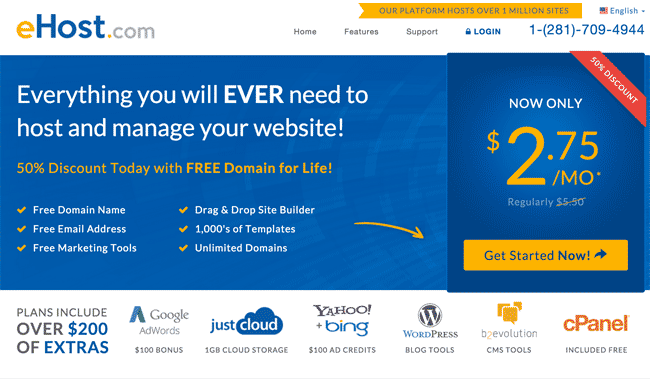 Does eHost give me a free domain name? Yes. eHost pays for your domain name for the first year of your hosting plan. After that, you are required to pay the domain name fee annually to keep it active. Can I create a WordPress site with a Website Builder account? No. If you wish to create a WordPress website or blog, you must choose ‘cPanel’ as the account type. With a ‘Website Builder’ account, you can only create a standard website without CMS. It depends on your level of expertise and what type of site you wish to create. For a WordPress site, or other type of CMS such as Joomla or Drupal, you will need to go with a cPanel account. If you just wish to get a simple website online using templates and drag-and-drop features, then a Website Builder account is the way to go. The cPanel hosting plan offers much more freedom in terms of what you can do with your site, though. Can I change from one type of account to the other if I change my mind? Is eHost a good choice for an ecommerce site? eHost can accommodate small ecommerce sites. They offer apps for credit card processing, a choice of shopping carts, SSL certificates, mobile optimization and social media integration. They also provide $200 in marketing credits to drive traffic to your new online store. 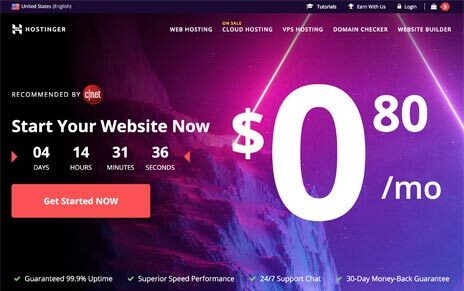 But because these shared hosting plans are not meant to accommodate large amounts of traffic or disk space, it limits the size and scope of your online store. Yes. According to the eHost Terms of Service, “If your shared server has a physical downtime that falls short of the 99.9% uptime guarantee, you may receive one (1) month of credit on your account.” Of course, there are some stipulations in place and issuance of the credit is solely at the discretion of eHost’s billing support team.